AzhwAr says that just as emperumAn is the most distinguished when it comes to bestowing benefits, he [AzhwAr] is also incomparable when it comes to being affectionate towards emperumAn. pinjagan thannodu edhirvan – I will be equivalent to Siva who is very knowledgeable and who bestows knowledge on others as mentioned in mAthsya purANam 67-41 “ISvarAth gyAnam anvichchEth” (let the chEthana desire knowledge from Siva). When asked whether there is total equality between rudhra and him in all aspects, AzhwAr says . . .
avan enakku nErAn – rudhra will not equal me in other matters. When sathva guNas (purely good qualities) gain prominence rudhra will say as in ISvara samhithai “dhAsabhUthAs svatha: sarvE hyAthmAna: paramAthmana: I athO’hamapi thE dhAsa ithi mathvA namAmyaham II” (all the jIvAthmAs (sentient entities) are by nature servile to you; hence, knowing that I am also your servitor, I am bowing down to you) and as in SrI vishNu purANam 5-33-41 “krishNa krishNa mahAbAhO jAnEthvAm purushOththamam ” (Oh krishNa, with mighty arms! I know that you are the greatest among all souls). Since rudhra says that emperumAn is the protector, AzhwAr says that rudhra is his equal to an extent. When qualities of rajas (passion) and thamas (ignorance) are prominent, rudhra will say as in SrI bhagavath gIthA 16-14 “ISvarOham” (I am the controller) and will even oppose emperumAn in warfare. Such rudhra will not be equal to me, says AzhwAr. AzhwAr mercifully explains the basis for the distinction that he has to say that rudhra is not equal to him, in the coming lines. adhirum kazhaRkAla mannanaiyE – the only one who annihilates his enemies by the sheer roaring sound of his anklets, thus protecting his followers. This indicates his greatness. Now, in the next word, AzhwAr indicates his simplicity too. 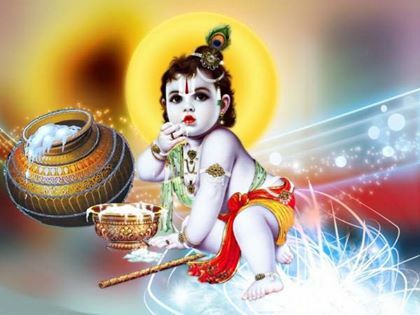 kaNNanaiyE – krishNa who was born in the clan of cowherds. nALum thozum thozhil – worshipping emperumAn as full-time profession. kAdhal pUNdEn – as the basis for that, I developed affection towards emperumAn. Thus, for me who is a permanent servitor for kaNNan, rudhra, who fought against kaNNan in the bANAsura yudhdham (war) cannot be an equal, implies AzhwAr. We will take up the 85th pAsuram next. This entry was posted in iyaRpA, nAnmugan thiruvandhAdhi on September 11, 2018 by T N Krishnan.